Having been absolutely stunned by the greatness of St. Athanasius' The Incarnation of the Word of God earlier this year, I thought that I ought to read Anselm's classic work in defense of the penal satisfaction view of the atonement, Cur Deus Homo (or Why God Became Man). It turns out, this is a tremendously short and potent treatment of the subject. 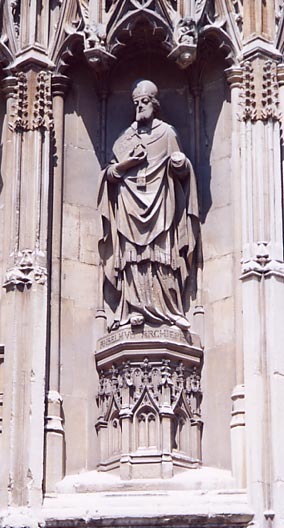 I have little understanding of the nuances of Anselm's theology beyond my own reading of The Monologion and Proslogion during my undergraduate studies. Not a fan of the Ontological argument myself (and I believe Van Til regarded it as a completely autonomous, man-centered non-argument) I nevertheless have a huge appreciation for Anselm's piety, his wisdom, his intellect, and for his faithfulness in articulating and defending the Christian understanding of the atonement. Having finished the book, however, I was most pleased to find such a remarkable and straightforward statement of the Gospel from a period which many Christians regard as a dark time in the church's history. To read someone like Athanasius or Anselm and to see the Gospel light shine so brightly and clearly is incredibly satisfying. Sure Anselm makes some questionable statements at times, but it is possible to have a problem with some of the trees and yet still completely love this forest. One thing which I have heard is that Calvin's understanding of the atonement differs somewhat from Anselm's. I would need to do further study to understand the nuances between their views, but for my own part I presently have not noticed any significant differences. Among other things, I noticed in the book that Anselm has a very high view of Divine sovereignty. At one point in the book, Anselm states quite clearly that God decrees sins. "No reasonable being can think otherwise." "All that you say is satisfactory to me." "Your speech gratifies my heart." "Nothing can be more sound." The list goes on. Boso really respects Anselm. The student is half afraid to meet one of the great philosophers face to face. He feels himself inadequate and thinks he will not understand him. But if he only knew, the great man, just because of his greatness, is much more intelligible than his modern commentator. Most importantly, reading Anselm's Cur Deus Homo reminded me of the terrible weight of my own sin before a holy God, and of the greatness of our Savior, Jesus Christ, who bore my own wrath on the tree and took upon himself all that was mine, so that I would receive all that is his.